Bartending has to be one of the most fun jobs in the world. We have our reasons. As a bartender, you offer up a product that customers crave. So how does someone get started? Research! Now this isn’t just spending a few hours searching the internet for How To Become a Bartender. Your research should be in the form of pulling up a stool to ask the lonely bartender how they got started. We have a few stories from past students, but talking to a dozen, or so, bartenders is definitely the best way to go. Start at the bottom In big restaurants and bars. Be a jack-of-all-trades and target smaller restaurants. Take a bartending course and learn. Without any experience whatsoever, a restaurant might take you on as a dishwasher…assuming you can at least tell the difference between a clean and dirty plate. Given time, maybe they move you to the front of the house to help clean up the place. 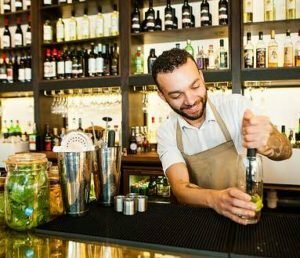 If you happen to be lucky enough to move to a host or hostess position, then maybe you can graduate to serving…then eventually behind the bar. This is a very long process though in any established restaurant and you will continually get frustrated by new hires stepping into those vacant positions because they have experience. If you have lots of time and faith management will eventually do right by you, then this might be your best approach. Again with little to no experience, seeing a ‘Help Wanted’ sign in the window means the management just needs a warm body to help out in the place. Now this doesn’t mean you would coming into their establishment as specifically a bartender. You would be expected to do a little of everything. Drinks, cleanup, sweeping up garbage around the parking lot, light food preparation in a pinch. Sure it is a quicker path to behind the bar, but in many of these establishments all you would be serving is light beer and wine from a box. Hardly what you were thinking a bartending career should be. There are numerous Youtube videos out there and online courses that will coach you through the basics of bartending. These courses are designed for those looking for a quick introduction. History of each of the spirits can be reviewed and memorized. Recipes for common cocktails can be committed to memory. You would still be lacking much in the way of hands on skills though, unless you had access to a bar and a whole lot of friends willing to try out your practice drinks. Online learning programs are general in nature. They won’t be able to tell you about what kind of drinks are popular in Vancouver, or wherever you live. They won’t outline best practices for your region, or what local bars are really looking for. There is much more to learn than how to crack a beer or mix a rye and Coke. Fine Art Bartending has been around for more than 30 years, teaching not only drink recipes and booze history, but also real hands on drink practice. Participating in a class where an instructor can outline best practices is way different than learning at home. Experienced instructors will coach students through proper bottle handling to minimize arm and wrist strain, as well as efficiency tips to speed up drink preparation. Speed, accuracy, and presentation all translate to more tips. A customer tossing a dollar or two into your tip jar is the ultimate compliment to your drink making abilities. With all those years of continually revising our content, updating recipes and best practices to reflect what local bartenders really need to know, we now have the best bartending course in Vancouver, which is also why we teach the most students in town. Register today and we will teach you how to become a bartender!